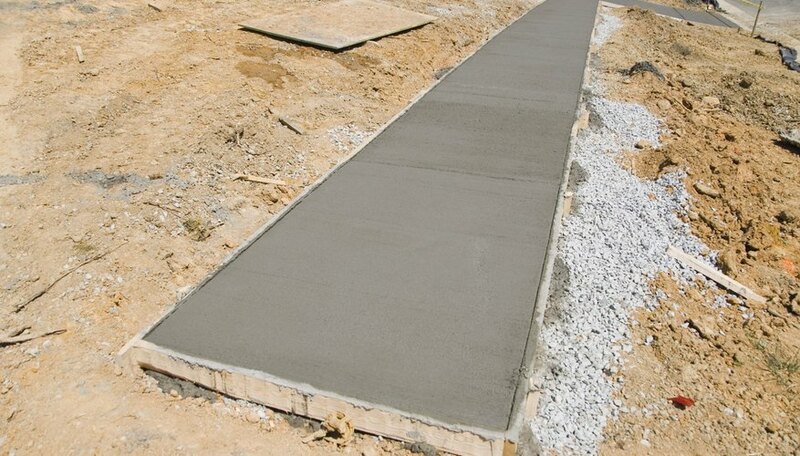 Concrete is typically a dull gray color, which makes for a good blank canvas. Water-based concrete paints come in a variety of colors that can turn drab concrete into beautiful decorative elements, advertisements or camouflage for gardens or other areas where concrete should not be noticeable. Concrete paints can be purchased at local hardware or paint stores and are as easy to use as indoor house paint. Cleanup is fast with soap and water. Concrete paint will not fade, but it is not unusual if it chips off and needs touch-ups once in a while. Cure the concrete that will be painted on for at least four weeks to make sure it is completely dry. Clean old concrete by using water from a hose and let it dry completely. Sweep off or vacuum concrete before starting to paint. Draw out any design you like in chalk on the concrete. Use the flathead screwdriver to open the paint lid and stir the paint well with a stir stick. If the paint is too thick to brush on, add a minute amount of water to the bucket of paint and stir again. Repeat adding water until the results you desire are attained. Pour a small amount of the mixed concrete paint into the paint liner inside the paint tray. Use the small brush to cut in the edges of where you are painting. Cut in about 4 to 5 inches. Pour a larger amount of paint into the paint tray. Dip the roller in the tray, then roll it back and forth on the top section of the tray, helping to distribute the paint evenly on the roller. Using the roller, paint with smooth strokes in one direction, either all "up" or "down". Allow surface to dry completely. Repeat with a second coat of paint. Retouch any areas that the roller was not able to reach using the cut-in brush. Allow to dry. Concrete does not require a primer before painting. Wash out all brushes, rollers and paint trays with water and soap. Store leftover paint in a sealed, air-tight container, which can be re-used for touch ups. If you are painting a smaller pattern on a larger surface, paint the entire area one color and allow to dry, then go back with chalk and draw on your design and fill it in using the cut-in brush or other smaller brushes for acrylic or water-based paints. Make sure to purchase water-based concrete paint. It does not contain lead. If you have allergies to paint, wear gloves. Ellen Dean is a visual artist and painting teacher. She has been teaching and writing articles on art since 2001, and has been a professional artist since 1999, (ChadwickandSpector.com), after studying sculpture at Virginia Commonwealth University. She is an NYFA Fellow and was nominated by the Sovereign Art Award/Sotheby's Hong Kong, two years in a row.